loves: smiling, reading books, swinging, talking, his mobile, mirrors, car seat toy, talking baths, watching the computer, being held. sleeps: on his tummy, with two blankets. the monitor is set to static & i turn the mobile on 'heartbeat' sound effect. (that is on a timer & goes off) the record is 7.5 hours. (now i am the one who needs to learn to sleep though the night. i wake up startled that i haven't heard him crying. as if that is possible.) he starts off the night in his crib & usually ends up sleeping with us after that. naturally i get kicked out of my spot & have to try to squeeze in where i can. eats: a lot. takes a bottle just fine. he is usually insulted by a pacifier. there is no food in that, why are you thinking i would want it?! wears: just starting in on 3-6, but still fits into most 0-3. unless it is footie pj's. then they are way.to.short. size 2 diapers. fun facts: B has one extremely long eyelash on his left eye. his nails grow fast. he gets ear wax. he sneezes at least once a day. he gets goosebumps. 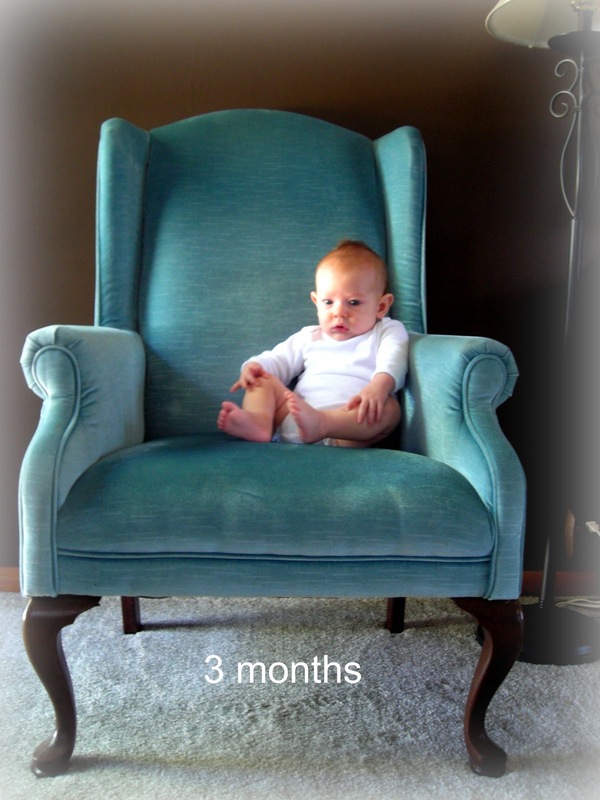 i can't believe it is already been three months! i have a three month old. i can't help but thank God every night for the sweet little boy he has given me. i love being his mother. and you are a great mother. I just LOVE the photos in the blue chair. Adorable.